The caracal is a wild cat whose adults can reach more than a meter in length. A pair of thieves seems to have interpreted the phrase “cat burglar” a bit too literally Tuesday morning, having gained entry into a Moscow apartment under false pretenses and then made off with an inordinately expensive kitten. 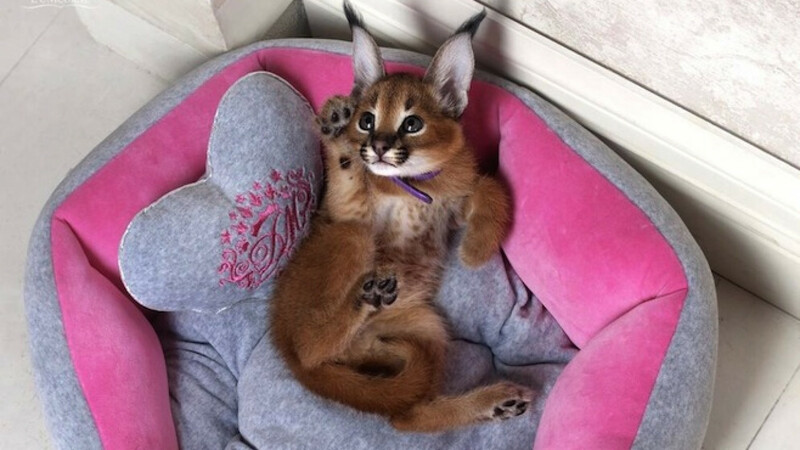 The cat's owner, a professional breeder, estimated the value of the kitten — a wild caracal cat — at about 400,000 rubles ($12,000), Interfax reported Tuesday, citing a police spokesperson. The suspected thieves, who posed as potential buyers to gain access to the apartment, also stole about half a million rubles in cash during the heist, which was carried out at gunpoint, the report said. Police said they were carrying out all necessary measures to track down the suspects, the report added. The caracal, also known as the desert lynx, is a wild cat that can grow more than a meter in length. Its habitats include Africa and parts of Asia. In March, a leading environmental official shed light on the problem of illicit exotic pets in Moscow. “In 2013, we continued to closely monitor pet shops, zoos, markets, hunting shops and dolphinariums to reveal any cases of illegal trafficking of animals on the list of endangered animals and of animals protected by the CITES convention. Violators are currently involved in administrative cases. About 100 animals have been confiscated, including monkeys, pythons, iguanas and chameleons,” Moscow Department of Natural Resources and Environmental Protection head Anton Kulbachevsky said at a departmental board meeting, RAPSI reported.